Death is not a subject that many people want to discuss or even think about, especially when it revolves around the death of a beloved animal. However, as tough as this subject may be, I believe that if we allow ourselves to see it differently, we can find peace and comfort in it. We may even come to see it as a gift. I have been around animals in a professional setting for over 20 years. I have lived with companion animals for 36 years. Death has always been an aspect of living and working with species of all shapes and sizes. Sometimes death came slowly and I was prepared, and sometimes it came when I least expected it and knocked me to my knees. Sometimes it lingered and I dreaded every moment up to it. Each time it was difficult and I struggled to understand what the animal was experiencing and why it had to be “that way”. I finally found many of the answers that I had so desperately asked for all of those years. Six months ago today my beloved Samantha passed into spirit. Samantha’s body had been struggling to overcome a malignant mass in her chest cavity. This mass was forcing fluid into her lungs, making it very difficult for her to remain active and breathe normally. We aspirated her chest several times to remove the blood and fluid, and the vet recommended that I give her a steady and strong dose of meds that would help pull fluid from her body to keep the lungs clear. To our surprise it began to work, but the cancer was eating all of her muscle mass and what little fat she had. The meds were dehydrating her terribly. It was a delicate balance and she was still deteriorating rapidly. The veterinarian told me there was nothing further that they could do. Her body could give out any day now. It could be days, weeks, or months. It was now up to me to keep her as comfortable as possible. Every day I would have to leave her and not know if she was going to die while I was at work. I would pray that she would be alive when I got home. I raced home each night and desperately hoped that I wasn’t too late. She was always waiting there for me, patiently. This was my form of hell. Every day was so emotional and painful, but I knew she was holding on to life. I didn’t know how I knew. I just did. But when would it be time to let her go? When would be the right time to ease her suffering? So here I was, alone, having to make these live and death decisions for my dear Samantha. Mothers and fathers say that they don’t have a favorite, but I did. She was my girl. She had and still has my whole heart. I adored her from the moment I rescued her when she was a completely feral cat on the streets of New Orleans. She and I had weathered many of life’s storms (literally and figuratively). I knew we could get through this together. I was determined to do everything I could to help her live her last days in peace and surrounded with love. One of my best friends had recently said goodbye to her feline companion because of cancer. I finally understood what she had been experiencing. She reached out to me after he passed and told me about an animal communicator that she had been using during the time that he was ill. She said that this animal communicator was currently helping her with another one of her furry family members that was fighting the cancer battle, too. I was a little surprised to hear that she was a believer in “that sort of thing” because she is a very rational, science-based, fiercely intelligent woman. I figured if she believed wholeheartedly in it, there had to be some validity to this animal communicator. I took the plunge and contacted Pet Psychic Edwina. This was one of the wisest decisions I have ever made. This decision changed my life and Samantha’s life forever. My beliefs were challenged, and Edwina showed me another way of seeing, experiencing, and understanding my animal companions. It was one of the greatest gifts I have ever been given. It was a gift for Samantha, and from Samantha. It was our gift to each other. Through Edwina and her insights Samantha and I bridged the gap together. Recently I listened to an interview from another well known and respected animal communicator. She touched on many aspects of what I learned from Samantha and Edwina, regarding animal “death”, soul connections, and what really happens when they transition into spirit. Maybe after hearing what she has to share, it can help you as well. Do our animal companions go to the afterlife when they die? Will we see them in the afterlife? Do our animal companions return for another life? Is it okay to euthanize animals? You can read more about this interview here. Although it was months ago, it still feels like yesterday that we said goodbye. I miss her every day. But after what I learned from Samantha I understand so much more now. The pain, grief and suffering gave me the gift of knowledge, understanding and insight. I know that she is never really gone. I know now that there is no death. I know and trust that my animal companions hear me. They can hear all of us if we take the time to speak with them. When people say that the ones we love live on in our hearts, they really do because that is where we loved them, and love never dies. Goodbyes are only temporary. The ones we say goodbye to are always there when we think of them, when we remember our times together, and when we speak to them. 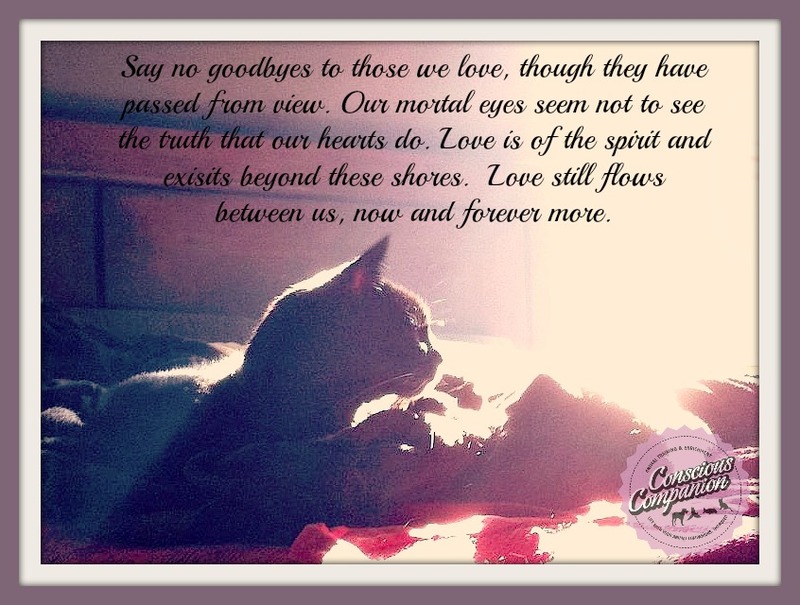 When you think of your beloved animal companion that has passed, know that they hear you. Feel their love that is endless. Believe that their spirit is free and never dies. If you were connected in life, you are still connected in the afterlife. Call on them when you miss them, when you need inspiration, or when you just want to say hello again. They are always there for you.